Many early Saxon names that identify towns and villages in Sussex must have been in common use amongst the settlers who first colonised the coastal territory of the two counties (East Sussex and West Sussex). Although these names became extinct by the seventh century, any well-versed storyteller of the time would surely have known their derivation. For the purpose of this discussion, the possible precursor of the Rapes, the location of a name must be the most significant issue if onomastic evidence is to be proffered to establish a conjecture. There is hardly any other resource available. The idea now put forward is that Ælle could have used an onomastic series to name his sons. Sometimes Anglo-Saxon rulers employed this naming pattern for their children, as did King Aethelfrith of the Deirians in the late sixth century, using the prefix -OS to name his sons. The names in question for the postulation here are Cissa (Cissan Ceaster = Chichester), Cilta (Ciltan Tun = East Chiltington), born around 483? and Cidda (Ciddan lea = Chiddingly), born around 483? It is proposed that in around AD 510 Ælle would have had six centres of power spread across his warlordship. West of the Arun there was Hayling Island (Haegal, according to the traditions of the Ayling family of Sussex, the place-name form of Ælle. The letter "g" here would have been pronounced as a "y" in Old English, but compare also Hailsham and the River Ellesham), and Chichester. West of the Adur was Wlencing (Lancing), and east of the Adur was Ciltan Tun, Mealling (South Malling) on the Ouse and Ciddan Lea just west of the Cuckmere. There would have been Cymen Wlencing's settlement of Cymen's Shore near Selsey as well. From this we may have the high born members of Ælle's warmoot: Cissa, Cilta, Cidda, Mealle and Cymen Wlencing, a conjectural warmoot whose centres of power could also have been the precursor of the Rapes. The presumed spread of the locations of royal authority discussed in the note on King Cissa's Witenagemot, given below, would have completed the basis of the later divisions across the old county. 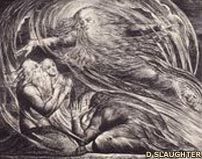 As a monk, Bede believed in the omnipotent God expressed here by Blake. Bede declares that it was God who granted victory to the Britons at Mount Badon. It is possible that Ælle's warriors, having destroyed Rhegin, were decimated in their turn by the Britons. Had this happened, it would have taken Ælle many years to regather his forces. Maybe, Ælle and his closest relatives were lucky to survive. If this was so, then Ælle's high status warmoot is more readily understood.